Tuberculosis might sometimes be perceived as a disease of the past. But in Papua New Guinea, TB is so rife the government has declared a state of emergency. It remains the leading cause of hospitalisation and death. At least 10 people die every day of TB and there is a growing emergence of drug resistance - making it far more costly and difficult to treat. More than a quarter of TB cases are children, due to a high transmission of the disease in crowded households. Even in rural areas, where space is ample, up to six family members will regularly sleep in the same room. In urban areas, such as the country's capital of Port Moresby - a TB hotspot - there is a severe lack of proper housing and infrastructure, meaning TB spreads quickly and aggressively. Dr Luo Dapeng, Papua New Guinea representative for the World Health Organisation, says health education in tackling the epidemic is made much more difficult when more than a third of the population is unable to read or write. "Literacy in Papua New Guinea is poor. And access to communities, even those in urban areas, can be hard. We will visit one place and we'll need two or three interpreters with us, due to the huge number of languages spoken here." Papua New Guinea is the most linguistically diverse country in the world, with nearly 850 languages spoken. This creates a new, unique set of challenges for NGOs and government officials who are working to treat TB patients. "We believe educating children is one of the most important places to start," says Dr Dapeng. "Then they will grow up with the knowledge of what TB is, and how to recognise symptoms, as well as hopefully passing the message onto their parents, who often believe TB is caused by witchcraft or sorcery." 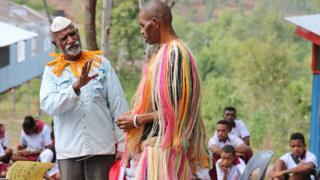 In National Capital District, one of the worst affected areas in Port Moresby, 62-year-old Rodney Kove is using drama to teach children about TB. Having studied dance and theatre at the University of Sydney, he returned to Port Moresby in 1975 to start Kove Theatre Group, which aims to tackling social issues in Papua New Guinea through drama. In recent years, he has turned his attention to raising awareness about TB. "Drama is a very effective tool of communication," he explains. "Culturally, people here are entertainment-oriented here. Putting money into posters is useless, as many people cannot read. "We are trying to reach everybody with our drama, and so we devise sketches to target specific communities, such as children and young people, about the signs and symptoms of TB." On World TB Day last March, Mr Kove and his theatre group put on a play in Port Moresby about sorcery and TB. "It is an issue here that people believe TB is caused by witchcraft. This is very detrimental as it means patients will not seek treatment, because they believe either they haven't got TB, or they think it can be cured by shamans. "I have heard reports of a woman being stoned to death by her tribe because they believed she cursed someone with the illness, so we addressed that in the play. "It's about changing attitudes and misconceptions." It's a common frustration among government officials that efforts to combat TB are being hampered by low literacy. Education about TB in rural areas - where 85% of the population live - is of particular concern, as doctors struggle to reach all of Papua New Guinea's communities. Many will still not even know of TB's existence, and therefore fail to recognise symptoms and access treatment. "We have to do more to educate the population on the ground," says Dr Paul Aia, director of the TB programme at the Department of Health. "We have tried printed media, but due to our country's literacy situation, and all the different languages we have here, it is not a viable solution. Theatre can be accessed by so many more people. "We have a target to get everyone in the National Capital District informed about TB. We've started in schools already, sending the theatre groups in there - which is a very unusual thing to do in this country - and students are the best demographic to get through to their parents." Cathy Tolom has been working as volunteer in the ATS settlement with Mr Kove for the past three months, and became involved in the theatre group four months ago. She says drama is far more effective than simply speaking with communities. "When we try to go out and do awareness by speaking, like marketplaces, there are other activities going on, so people don't concentrate. But when you put it out through drama, they come and see what's happening and then the message is passed on." Ms Tolom says the group, which is currently working with two schools, is planning to reach more in the future, and work with churches to access as many people as possible. "We are lacking in government services," she adds. "And we are lacking in doctors and officials coming to educate people on TB, so this is why we are doing it ourselves." "We really need to focus on awareness. You cannot just drag people into a room and educate them." The plays are around 15 minutes in length in order to keep the audience engaged. "People underestimate how effective it can be as an education tool," Mr Kove continues. "It is so engaging. We can get children involved and get them to put on their own plays. And it doesn't cost much money at all. You can just pack up a few props, a few people, and travel around to perform." Mr Kove's TB plays have only been running for the past year, but he hopes to one day perform in every school and every district in Papua New Guinea. Is Sara a "refugee" or a "future surgeon"?